Fluttering through the Seasons: 100th Day Fun! Belle and Keefe had their 100th day celebration in school yesterday. Weeks before the celebration, parents received an email from the Grade 1 team asking all first graders to dress up like they were 100 years old. We bought a white wig for Belle which obviously, she didn't wear yesterday! She had her hair sprayed gray instead by a fellow first grader. Belle came home telling me that they got to go to all the first grade classrooms to do activities revolving the number 100 (100th day crown, 100 chains, 100-year-old self-portrait, 100th day hidden picture, number 100 eyeglasses, 100th day of school word search). The night before the celebration, Belle made a 100-year-old self-portrait (inspiration from here!) ~ love her fashionable 100-year-old granny! We continued the 100th day fun at home. Belle and Keefe both did a 100th day hidden picture, each differentiated to their levels. I wrote numbers on stickers and pasted them on chocolate coins for Keefe to work on his number recognition. I typed up some +10 and -10 problems for Belle to work on her math skills, cut them up and taped them into mini jellies. I wanted to use Hershey's kisses but there were NONE to be found in Basel or Germany or France! Belle and Keefe also read 100 sight words, and did their writing ("When I am 100" and "If I had $100"). 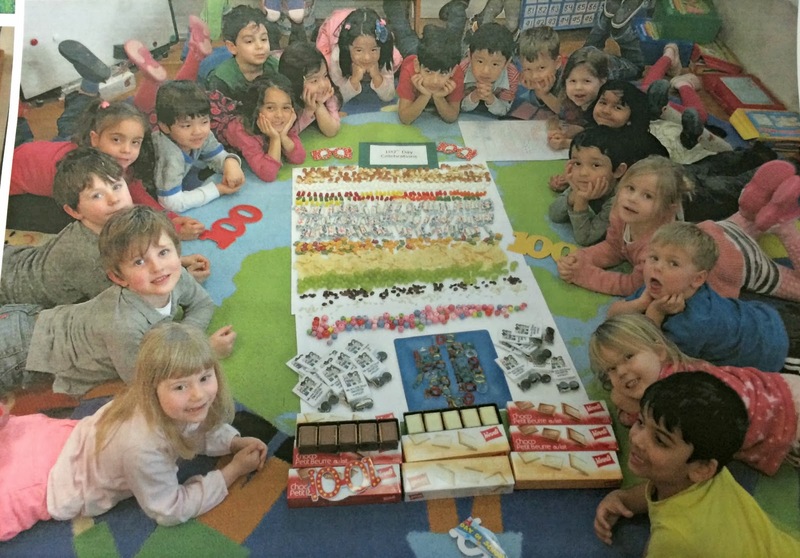 They were presented with a 100th day certificate, a personalised $100 note and a small gift for them to remember the 100th day. And of course, 100th day wouldn't be complete without 100th day food! I prepared treats for Belle and Keefe's friends (number 100 made out of chocolate sticks and mini Oreos). Belle and Keefe had a 100 mid-morning snack (a mozzarella stick and two potato smiles), 100 lunch (a hotdog and two mini pizzas) and a 100 dinner (a chicken stick and corn kernels in two cups). And while his siblings were having their 100th day fun, Kai was busy eating the chocolate coins and mini jellies. He cried when he didn't receive a certificate (noticed the tear in the middle picture below?) but was ok after receiving a personalised $100 note, a Thomas sticker book and a Toy Story notepad. 100th day was so fun but oh-so-tiring for this mom! What a special celebration! I love the 100th year old grandma belle!